Everyone can agree, to be a mom is to be a superhero. You fit right in with everyone’s favorite heroes in the new Avengers: Infinity War! Not even Iron Man, Thor, or Captain America can save the day the way you do. Now that the kids are headed back to school, your “crime fighting skills” are about to be put to the test. Sporting events, homework, ballet, that PTA meeting you really should go to, plus a delicious dinner? All this makes leaping buildings in a single bound seem easy! Luckily, the Mr. Food Test Kitchen is here to be the perfect sidekick. How? By sharing our secret to serving your hungry students a delicious well-balanced dinner, in no time at all! Our secret weapon is an absolute must have in the tool belt of every hardworking parent. And that secret weapon is…the easy meals found in your grocer’s freezer case and your air fryer! Our this dynamic combo is how we made this delicious Come-‘n’-Get-It Sampler; a recipe that will satisfy anyone around the dinner table, since there’s something for everyone! Plus, with our simple to read chart, you’ll have more easy air fryer recipes than you know what to do with. You can add “makes delicious meals fast” to your superhero resume, just in time for the back to school rush. Step One: Gather Your Favorites! What is our Come-‘n’-Get-It Sampler Platter, you ask? It’s something we whipped together by combining a few different foodie favorites on a single serving plate; like a good old fashioned pu pu platter, you put together your favorite assorted appetizers and finger foods to serve up at any occasion! 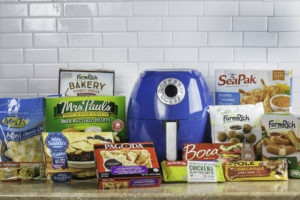 The best part about these easy air fryer recipes is that you can get everything you’ll need from your local freezer aisle! 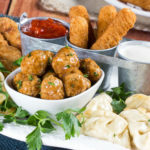 Frozen foods are the ticket to making a delicious weeknight meal fast, and the air fryer is a healthier option for parents trying to make the foods kids love, without all the grease. To start making this tasty feast, we gathered some of our favorites. 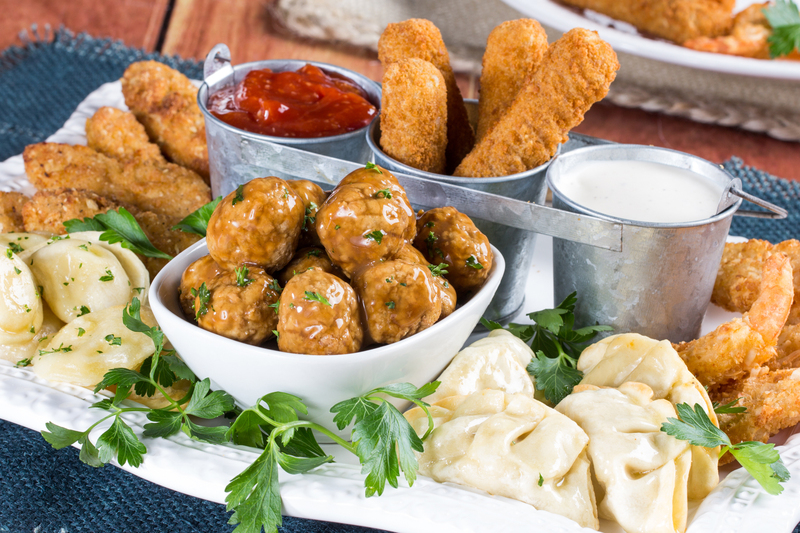 Farm Rich® Original Meatballs, Mrs. T’s® Pierogis, Farm Rich® Mozzarella Sticks, SeaPak® Jumbo Coconut Shrimp, Pagoda® Chicken Potstickers, and Gardein® Seven Grain Crispy Chick’n Tenders! These are the yummy treats we chose to include in our platter, but you can use whatever sounds best to you! Be sure to check out our Air Fryer Chart for other kid friendly options. Step Two: Get Cooking with Our Easy Air Fryer Recipes! Yeah, this recipe is that easy. That’s why we love the air fryer! You gather your ingredients, turn on the air fryer and get cooking. Toss what you want into the air fryer basket and your trusty machine does the rest. Since these frozen goods don’t always come with directions to cook them in an air fryer, we had to get creative! To help you make all these delicious treats, we’ve included a chart we think you’ll find very handy. Click HERE to get a complete run down on how to cook all of your favorites! 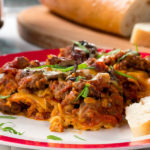 It’s the ultimate guide to making these frozen meals air fryer friendly, and there are enough options to please even the pickiest eaters (Not to mention a super mom who’s trying to get her kid to eat a well-balanced meal)! Before you get cooking, let’s take a look at some of our favorite tasty treats; you can find all of them in our Come-‘n’-Get-It Sampler Platter! First, you’ve got Farm Rich® Original Meatballs. Let’s talk about flavor! You can serve them just as they are or in a special sauce. These will bring you and the kids straight to meatball heaven after just one bite. The Test Kitchen LOVED these! They’re a fast and easy air fryer recipe that could be served at an after-school dinner or on game day. These meatballs are “flexible” and that’s what makes them so great. Mrs. T’s® Pierogis. We’re not lying when we say these babies will save you a trip to Poland! These pierogis are based on a recipe that was passed down by everyone’s favorite Polish grandma, and now she’s sharing them with you. That must be why Patty loved these so much; where else could you find an easy air fryer recipe that tasted like it came from the old country? Next, these Farm Rich® Mozzarella Sticks are sure to get the party started on the right foot. These delicious sticks are made fast and are made with real mozzarella cheese. They’re a favorite of kids and adults alike, and one of our all-time favorite air fryer recipes. You’ll love them too, as they make the perfect center piece for our Come-‘n’-Get-It Sampler Platter. For something unexpected try these SeaPak® Jumbo Coconut Shrimp! Thanks to your air fryer, it’s never been easier to get something tropical on the dinner table, no matter where you live. Take the kids on a vacation with these golden brown, flaky, and coconutty shrimp. Next, we’ve got a blast of flavor from the East! These Pagoda® Chicken Potstickers are made with real white meat chicken and they are an authentic way to do Chinese takeout at home. This easy air fryer recipe is going to blow everyone away. Especially when you serve it with their Lime Ponzu Sauce! And last but not least, you can’t miss the Gardein® Seven Grain Crispy Chick’n Tenders! These chick’n tenders are the most surprising recipe on our platter and you’ll be pleasantly surprised when you realize why! The flavors are perfection and, when they’re this easily made in your air fryer, they’re sure to be a hit with everyone! You can find all of the delicious and easy air fryer recipes in our Come-‘n’-Get-It Sampler Platter! But we’re not done bringing you tasty recipes to make in your air fryer. You can even make desserts like Mrs. Smith’s® Blackberry Cobbler; it’s the perfect easy dessert option because you can toss it in your trusty air fryer and let it cook while you and the family enjoy the main course. Take it out of the air fryer, melty and warm, and top it with a scoop of ice cream for something completely indulgent. And you won’t want to miss out on tasty Farm Rich® Donut Holes! They’re the perfect pop-in-your-mouth dessert for any sweet tooth, and about as American as you can get. Our Air Fryer Chart has all the information you need to make these easy dessert recipes. Who knew a feast could come out of your little air fryer? That’s all there is to it. 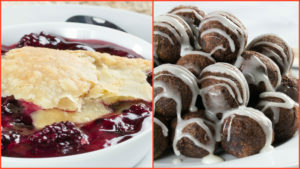 Our Come-‘n’-Get-It Sampler Platter, and these easy air fryer desserts, are all you need to up your superhero game! The school year starting is the perfect time to bring out your secret weapon: the dynamic combo of delicious and nutritious freezer meals and your handy air fryer. Now you’ll always have a way to nail dinner, even when you’re on a time crunch; you may even have time to go check out the Avengers in their latest blockbuster, and that’s family-time at its best. So, thanks mom; thanks for dinner and thanks for being you. We think you’re super. Tell us about YOUR favorite weeknight dinner option! What meal always puts a smile on your family’s faces? Plus, head over to the Mr. Food Test Kitchen Facebook for more fun and tasty recipes.